Just outside of Harbor Springs in a beautiful rolling valley, is Boyne Highlands. This world class facility is a year 'round resort with three golf courses, downhill skiing, cross country skiing, snowboarding, snowshoeing, fabulous lodging and dining--you name it, Boyne Highlands has it. In the summer, the golfing at Boyne Highlands is truly spectacular. Stay in the main lodge or a condominium, go for a swim, shop for golf apparel, watch the sun set, or be dazzled by the Young Americans dinner theatre. 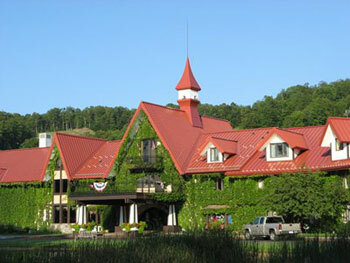 Boyne Highlands is a four season resort. Spring is perfect for not only golf but mountain biking or hiking. Try the zip line for family fun and adventure! Summer offers unparalleled golf: four spectacular golf courses plus a Par Three. Boyne has it all when it comes to the perfect Michigan winter getaway. Offering great snow, expert grooming and carved out glades, and superb skiing and snowboarding. New last season, the Zipline Adventures has you soaring through the trees and valleys down the mountain! And you can go for a dog sled ride with a dog team that has raced the Iditarod or enjoy romance at its best with a horse drawn sleigh ride. Try ice skating, tubing or snowshoeing for the first time or as a seasoned expert. Relax in one of the mountain-top restaurants with a hot chocolate, cold beer and fueling food and take in the action of the many on-snow events offered at Boyne Highlands. Mountain biking through Boyne Highlands trails is a experience with fun for the entire family.